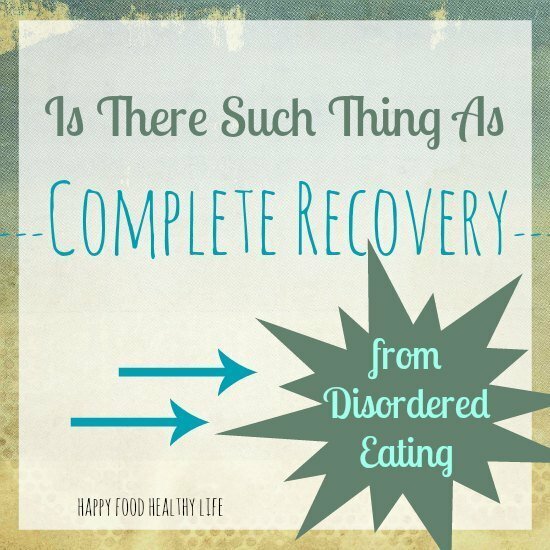 Is There Such Thing as Complete Recovery from Disordered Eating? This is something I’ve had on my mind for a few weeks, since a young man emailed me asking this very question. He wanted to know how I can speak about total recovery and being free when he thought food addictions and disordered eating was something you held onto for your entire life. That was a great question that kind of stumped me. I’ve heard it for as long as I can remember. If you are an addict (and I do consider disordered eating a form of addiction/coping mechanism), you have the addiction for life and you will always struggle with it. I’m going to say that I don’t 100% agree with that statement. What Does It Mean to be Recovered From Disordered Eating? Let’s start from the very beginning. What does recovery mean? The answer to this may be different for everyone. For me, recovery means being able to eat foods that I want to eat, and to eat them normally (not binging, not being secretive, not starving myself for weeks before and after, etc). To me, part of recovery is to be able to look at my body and not want to cut off every inch of fat – to see myself as beautiful – to see myself as MORE than a body. To me, recovery includes a healthy amount of exercise so that I feel alright with enjoying the foods that I want. Recovery includes safe and healthy stress-relievers that have nothing to do with food or a lack there of. For others, recovery could mean taking control of and finding direction in their lives. It could mean finding the courage to stand up against an abuser. It could mean finding a way to cope with the stresses of life without turning to food. It could mean wanting to live another week! Or it could simply mean, finding the ability to say no to food. Food can have a powerful control over some of us. It could be during stress. It could be during the highs and lows of emotions. Whatever it is, sometimes it’s hard to not give into food, and recovery for many of us may just mean having control over food rather than the other way around. Everyone’s recovery path is different. Everyone’s reason for wanting to recover is different. Will I Still Struggle with Eating Once I’m Recovered? From my personal experience, I am going to say yes. I struggle a lot of the times. There are many times I have to consciously ask myself, “Are you really hungry or are you just bored/stressed/emotional/etc?” There were years and years of learned behaviors that my body just hasn’t forgotten yet. The difference between then and now is that I have tools to deal with those behaviors. I know the questions to ask myself. I know the signs of an upcoming binge and how to stop it. I know the feeling I get when I think about restricting foods and I know how to get out of it. The great thing is that over the last few years of healthy eating habits, there are some things that now come naturally to me. Like when my stomach starts to grumble. In the past, that was a very unhealthy welcome sign of my body getting ready to start eating away at my flesh. Now, I feel that hunger pain and immediately know that my body is telling me something. My body is not stupid. Its signs are there for a reason. It is up to us to listen to them, and I am thrilled that it is finally becoming second nature for me to be doing so. Over time, the further you get into healthy habits, the more of them will start to stick, and the unhealthy habits will start to become distant memories. But yes, there will be times that challenge you. You may “relapse” into a moment, a day, or even a month of unhealthy habits. But once you have recovered once, you have the ability to use those same tools again. How Can I Stay Recovered and Not Relapse? * Keep yourself in check. Always ask yourself where you are in your eating. Why are you eating? Why haven’t you eaten all day? Be honest with yourself. * Be forgiving. This is key for me. I completely understand that there are going to be mess-up’s. I’m only human. The sooner I forgive myself for a bad day or afternoon, the easier it will be for me to turn around and get back to those awesome healthy habits I know and love so well. The longer you are down on yourself, the longer you will be stuck in bad destructive habits. * Have an accountability partner. Whether it’s someone who has been through the same issues as you or not, it’s important to have a friend who you can call on when you’re struggling. Someone who knows how to talk you out of your funk. Someone who knows what your “tools” are (see below for more info on your tools). This person may end up being your saving grace in moments of difficulty. This person needs to be someone you have no problems opening up and talking to about your feelings and habits. So the concluding factor is that, in my opinion, complete recovery is absolutely possible. I believe I will always be recovered, but maybe that’s because my definition of recovery is different than someone else’s. For me, I know that recovery means bumps in the roads. I will not beat myself up for them, and I will do my best to get back to being healthy as soon as I can. For someone who’s definition of recovery is to always eat healthy and never go back on bad habits (which is unrealistic), complete recovery may never happen for them, because set-backs are inevitable over time. Recovery is what you make of it. I have chosen recovery for life. I have chosen to not go down that path of unhealthy habits again. I may step a toe or two down that fork in the road some days, but my health and happiness will always lead me back to the path of recovery and well-being. What are your thoughts? Is complete recovery possible? Thank you for this inspirational post! More than 15 years since my last eating disorder related hospitalization, I still struggle with everything every single day. Reading about someone out there who’s really gotten better gives me hope! I am so sorry for your continual struggles. I still have battles some days too. But yes, there is hope. There is a light. Just stay positive and surround yourself with people who will lift you up.